Travel with P&O Ferries to Bilbao from Portsmouth for the ultimate ferry journey.With P&O ferries to Bilbao you get superb onboard facilities plus great entertainment.P&O Ferries depart from Portsmouth every three days for most of the year and offer the most convenient cruise style crossings to Spain for car and passenger. Taking the ferry from the port of Portsmouth to Bilbao port enables you not to have to drive the long distance travel through France. As a major city in Northern Spain, Bilbao is a great place should you be going on an onward journey into Spain. 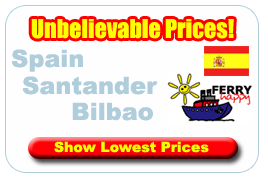 Bilbao Ferries port is Spain's biggest port and in the 6th largest city, is situated in the heart of the Basque Country and is a good place to see the regions attractions. Bilbao port is situated in the centre of the European Atlantic coast, on the eastern side of the Bay of Biscay. Bilbao port geographic location enables it to link with the main international ports, especially links with both the American continent and the north of Europe. After 700 years of acting as a port, Bilbao port nowadays have over 200 maritime services linking Bilbao with 500 ports worldwide. The Port of Bilbao meets the highest operational capacity requirements. Last year, Port of Bilbao handled over 110,000 passengers. Portsmouth a significant naval port for centuries and still the base for Nelsons HMS Victory remains the dockyard for the Royal Navy.As well as HMS Victory Portsmouth port is also home to many other famous ships.Portsmouth is the second busiest port in the UK, each year 3.5 million people travel from Portsmouth to Continental Europe. It has excellent road links from London via the M3 and A3. Whilst it may not have the quickest journey times to France and Spain, it gives the passenger a more relaxing enjoyable journey.Situated just to the north of the Naval Base is the Continental Ferry Port, which is the UK's 2nd busiest, offering both passenger & freight services. To the south of the Base by Portsmouth Harbour Station, is the Isle of Wight (Ryde) Passenger Ferry Terminal, & further to the south, off Gunwharf Road is the Isle of Wight (Fishbourne) Car Ferry Terminal. Portsmouth is a worldclass destination and offers fantastic attractions including the new Spinnaker Tower, Gunwharf Quays, the historical Dockyard, as well as it's own seaside resort Southsea. With an irresistable array of culture, history and heritage Portsmouth is fastly becoming Britains most popular harbour.In the centre of , the Cascades Shopping Centre offers high street names such as Marks & Spencer, H&M, Woolworths and BHS.